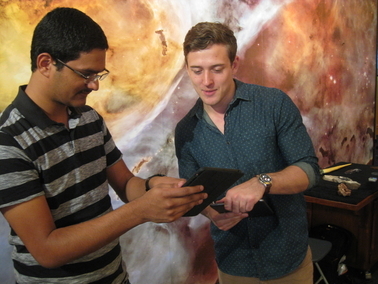 Dheeraj Yennam and Jared Korinko, from the School of Computing, Informatics, and Decision Systems Engineering, test the app at the Arizona Museum of Natural History in Mesa. A group of students and faculty in the School of Earth and Space Exploration and the School of Computing, Informatics, and Decision Systems Engineering have created an app that will feature an astronaut as a digital docent at two Arizona museums. The Arizona Science Center and the Arizona Museum of Natural History are partnering with Arizona State University to offer visitors an app to complement their exhibits. The app encourages museum visitors to ask questions and the app responds back from its database. The project is run by Judd Bowman, associate professor at the School of Earth and Space Exploration, Brian Nelson, associate professor at the School of Computing, Informatics, and Decisions Systems Engineering, and Cassie Bowman, associate research professor at the School of Earth and Space Exploration. Judd Bowman said museum exhibits tend to have a long lifetime, but they aren’t always updated as quickly as science advances. The app, funded by the National Science Foundation, currently covers more than 12,000 questions on various topics from astronomy to geology. Bowman said he and the team collected many of the questions three years before the development of the app. Museum staff will also have access to a dashboard that aggregates the popular topics and questions being asked on the app. To read the full story on the new app, go to ASU News.